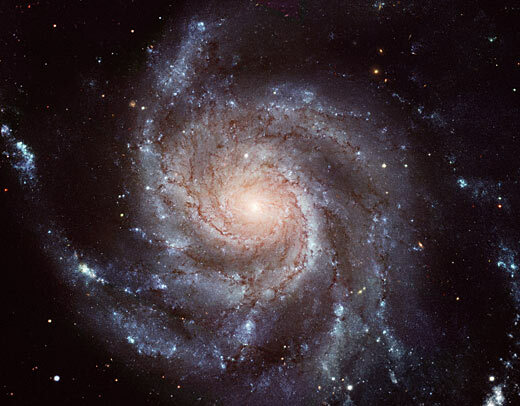 Spiral Galaxy M101, almost 170,000 light-years across, is twice the size of the Milky Way. This image shows stunning features of stars and dust seen along the galaxy's face-on disk. 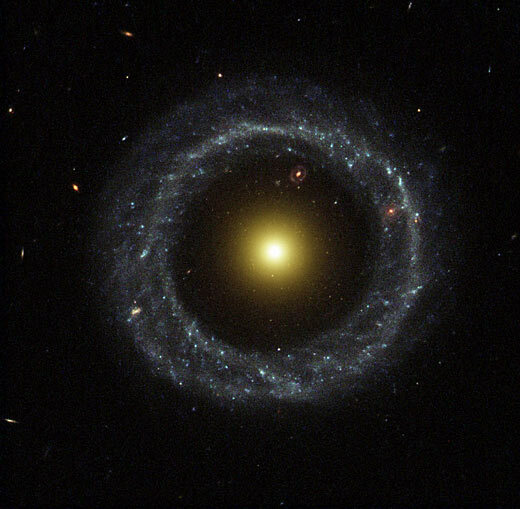 Background galaxies can also be seen; in some cases, right through the image of giant Galaxy 101 itself. 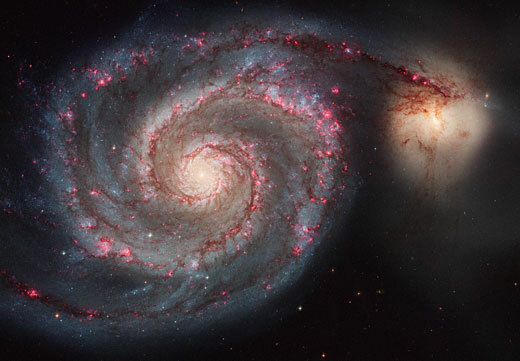 Two spiral galaxies pass by each other in the direction of the constellation Canis Major The larger and more massive galaxy is cataloged as NGC 2207, and the smaller one on the right is IC 2163. 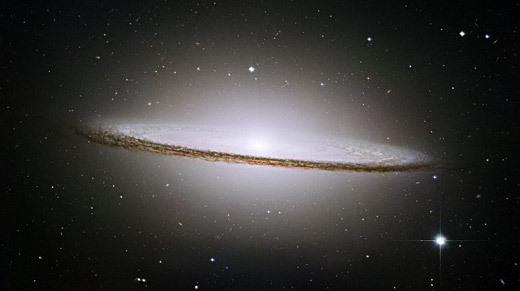 The shape of IC 2163 has been distorted by strong tidal forces and flings out stars and gas into long streamers, stretching out a hundred thousand light-years toward the right-hand edge of the image. 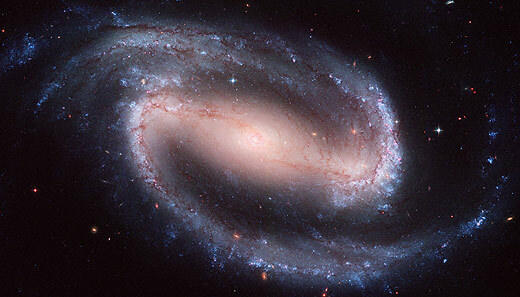 A composite image of a bar-shaped galaxy NGC 1300, located some 69 million light years away, looking toward the constellation Eridanus, captures a display of glowing gas, starlight, and silhouetted dark clouds of interstellar dust. 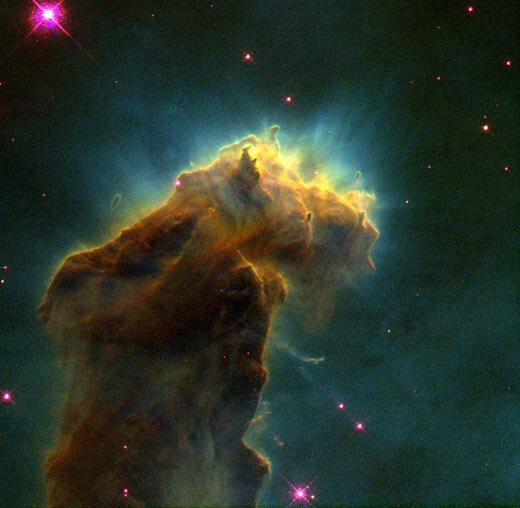 This eerie structure is a column of cool molecular hydrogen gas and dust that is an incubator for new stars. 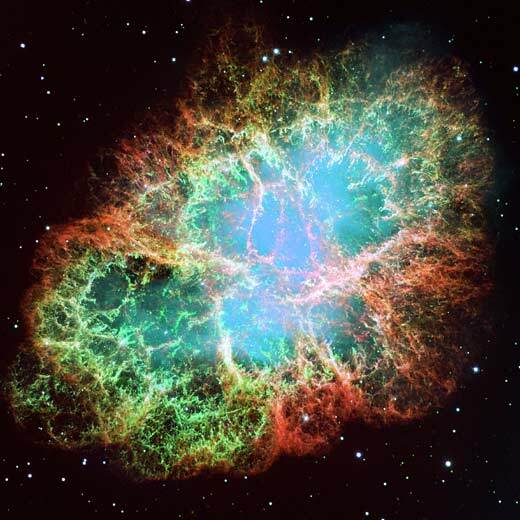 The stars are embedded inside finger-like protrusions extending from the top of the nebula. Forming inside at least some of the EGGs are embryonic stars stars that abruptly stop growing when the EGGs are uncovered and they are separated from the larger reservoir of gas from which they were drawing mass. 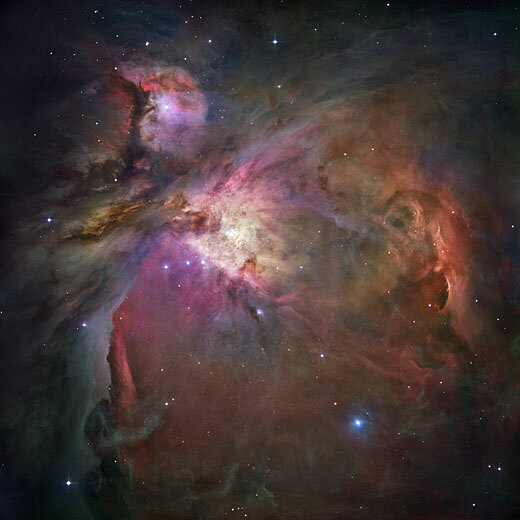 Hubble Space Telescope's fine guidance sensors have refined the distance to the popular open star cluster Pleiades, or Seven Sisters to about 440 light years. 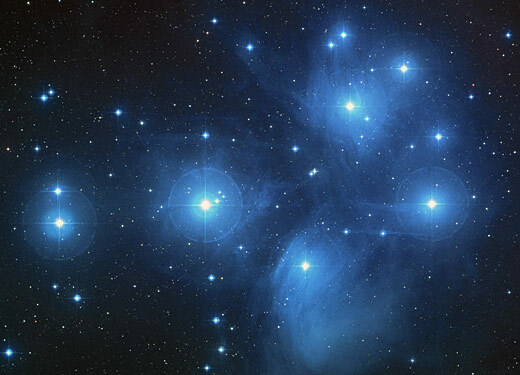 Some 1,000 stars comprise the Pleiades cluster, located in the constellation Taurus. Slight changes in the apparent positions of three stars within the cluster when viewed from different sides of Earth's orbit were also recently discovered. Two interacting galaxies, 300 million light years away toward the constellation Coma Berenices resemble the long tails of mice at play. 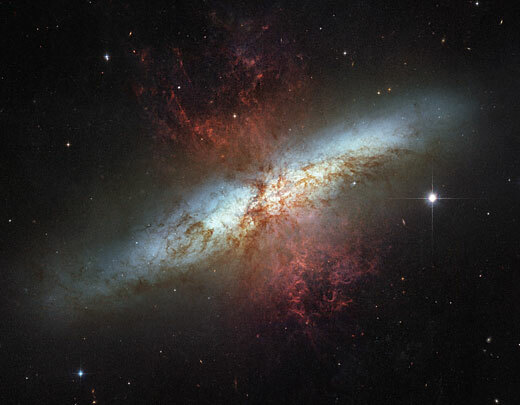 The Mice Galaxies, known as NGC 4676, are so named because the long streams of stars, gas, and dust thrown off of each of the galaxies is a result of their interaction. 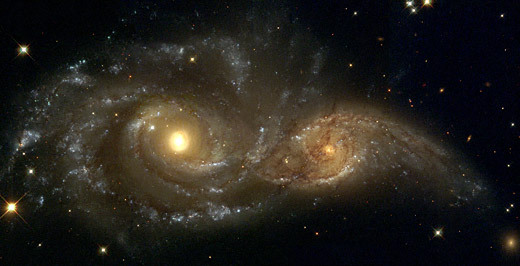 The Mice Galaxies will eventually merge to form one galaxy. 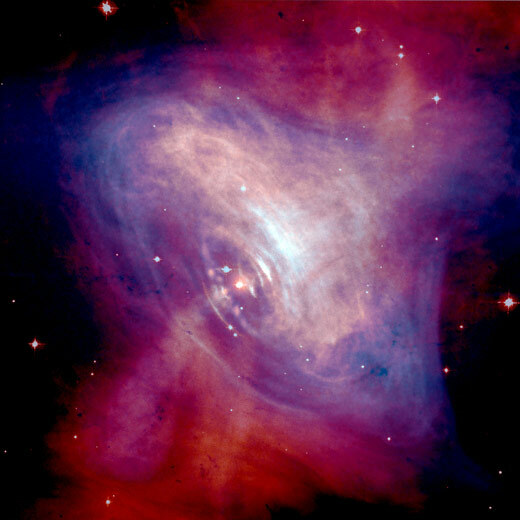 A composite image showing the X-ray (blue), and optical (red) images of the Crab Nebula superimposed, reveals an inside the "shell" view. The size of the X-ray image is smaller because the higher energy X-ray emitting electrons radiate away their energy more quickly than the lower energy optically emitting electrons.